An Atlanta research collaboration may be one step closer to finding a vaccine that will provide long-lasting protection against repeated exposures to human immunodeficiency virus (HIV). Harriet L. Robinson, PhD, chief scientific officer at GeoVax Labs, Inc., and former director of the division of microbiology and immunology at Yerkes National Primate Research Center, has been leading the research team with Rama Rao Amara, PhD, associate professor of microbiology and immunology, Yerkes National Primate Research Center and the Emory Vaccine Center. The research was presented Wednesday at the Conference on Retroviruses and Opportunistic Infections (CROI) in Seattle, Wash. The vaccine regimen included a DNA prime vaccine that co-expressed HIV proteins and granulocyte-macrophage colony-stimulating factor (GM-CSF). GM-CSF is a normal protein that promotes the initiation of immune responses and thus enhances the ability of the vaccine to elicit blocking antibodies for the SIV virus before it enters cells. Vaccination consisted of two DNA inoculations at months 0 and 2 to prime the vaccine response and then two booster inoculations at months 4 and 6. The booster vaccine was MVA, an attenuated poxvirus expressing HIV proteins. Six months after the last vaccination, both vaccinated and unvaccinated animals were exposed to SIV through 12 weekly exposures, resulting in an 87 percent per exposure efficacy and 70 percent overall protection. Over the next two years uninfected animals were exposed multiple times in two more series, resulting in an 82 percent per exposure efficacy during the second series and an 84 percent per exposure efficacy during the third series. "Repeated challenges in animals are used to mimic sexual transmission," says Robinson. "The hope is that the results in the nonhuman primate models will translate into vaccine-induced prevention in humans." "It is impressive to note that protection could be observed against both neutralization sensitive and neutralization resistant viruses," says Amara. Neutralization is the process by which some antibodies can block virus infection. A first generation GeoVax DNA/MVA vaccine that does not co-express GM-CSF has shown excellent safety and reproducible vaccine responses in Phase 1 and 2a clinical trials in more than 400 uninfected people. These trials, supported and conducted by the National Institutes of Health HIV Vaccine Trials Network, have set the stage for the second-generation GM-CSF co-expressing vaccine to move from its initial Phase 1 safety testing slated to start in March of this year to a Phase 2b efficacy trial in participants who are at high risk of exposure to HIV. The vaccine is designed for a version of the virus prevalent in the Americas. Robinson and Amara began their work at Yerkes National Primate Research Center at Emory and the Emory Vaccine Center. Robinson now leads the effort at GeoVax on manufacture and human testing of the vaccine while Amara leads the nonhuman primate component at Emory. The MVA component of the vaccine was developed at the National Institutes of Health by Bernard Moss, PhD. 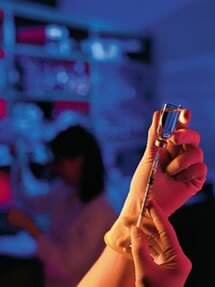 The intellectual property for the vaccine has been exclusively licensed from Emory by GeoVax for clinical development. Emory University has an equity interest in GeoVax and is entitled to sales royalties for the vaccine technologies being studied. Emory and GeoVax, and Drs. Robinson and Amara, may financially benefit if GeoVax is successful in developing and marketing its vaccines.